Many hikers prefer hiking shoes over hiking boots due to several reasons. If the terrain isn’t very difficult, a pair of hiking shoes can already give decent protection while being lighter, nimbler, and more comfortable. In this Merrell Moab Edge review, we will discuss about an impressively light hiking shoe that comes with plenty of traction from the Vibram outsole. 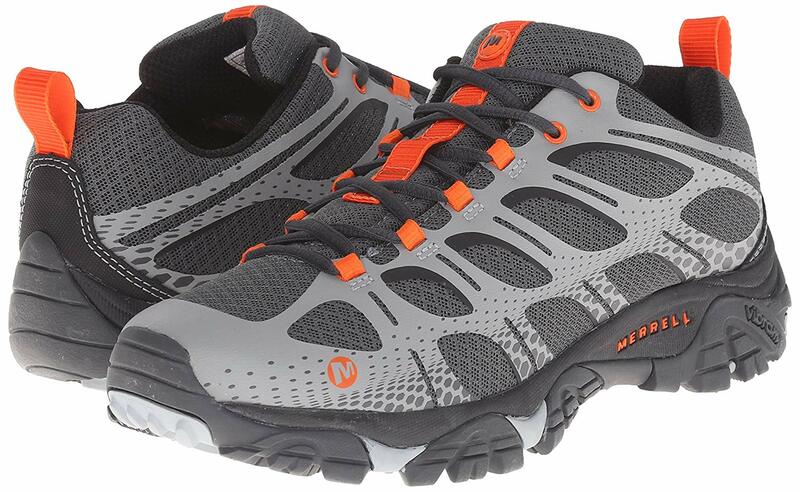 The very first impressive thing about Merrell Moab Edge is the incredibly lightweight design. Each shoe weighs only 1 lbs 11 oz. Even for a hiking shoe, this is really light. Walking, running, and climbing in these shoes will never become a problem. The shoes will not put any excessive mass that may exhaust your feet down. See also: X Ultra Prime vs X Ultra 2. Another advantage of the lightweight design is the nimble and responsive feel. You don’t need much of an effort to lift the shoes. As the effect, you can lift your feet easily. This is definitely a big advantage when you are running on a trail or climbing a rocky hill that requires you to mind your every step. The user reviews for Merrell Moab Edge’s fit is kind of mixed. Most reviews are positive, but there are also some critiques – this is not necessarily a bad thing. Most people say that Merrell Moab Edge fits true to the size. As far as your shoe number is concerned, this is correct. In most cases, there is no need for you to increase or lower the shoe size when ordering Merrell Moab Edge. This is great. However, some people have mentioned that Merrell Moab Edge is a bit wide. The toe box is rather wide, so your toes won’t feel the side of the shoe. The same thing goes for the heel area; it is rather wide as well. On the good side, it provides some free room for your toes to breath. It allows some air circulation, and since your toes aren’t strictly confined, they will not get sore. The slight disadvantage is that it does not feel really snug, even when you have tightened the laces. This is just the feel, as the actual shoe can stay in place very well. The laces are sturdy and quite easy to adjust. The lace system can hold the fit well. However, the lace loops don’t seem to be very durable, so you should avoid abusing them. Meanwhile, on the rear part of the shoe, there is a small stitched pull-tab that allows you to slip-on and slip-off the shoe easily. It is really handy. The upper of Merrell Moab Edge is constructed from mesh and 3D-printed mesh. It is lightweight yet quite tough and sturdy. It provides good impact protection. In addition, it has a synthetic overlay on the front of the toe box, so your toes will not get crushed when you accidentally bump into rocks or large roots. The shoe is equipped with a bellowed tongue. This tongue is quite soft and comfy. It is also effective for keeping debris and sand outside. The collar is pretty high without being excessively high like boots – just high enough to provide good ankle protection. So, the shoe will still allow you to move and maneuver nimbly without compromising your safety. However, Merrell Moab Edge is not really waterproof. It is just water resistant to a degree. If exposed to rain for an extended time, the water will eventually get in. At least, the side is pretty tall, so you can step on a water puddle without making your feet wet. The shoe is fitted with moisture wicking fabrics. This is truly an excellent feature. The upper is highly breathable, so the foot will never get overheated. Even if the foot gets sweaty, the moisture wicking lining is really effective in removing the sweat. With Merrell Moab Edge, your feet will never be drenched in sweat. Merrell Moab Edge comes with a sturdy and properly structured midsole. This midsole provides excellent shock absorption. Never in your walk that you will feel the heavy impacts of your steps. This is possible because the midsole is made from a customized and contoured EVA-blended material. In addition, the shoe has the air cushion technology. It has a thick rubber platform around the heel to provide enhanced shock absorption. In addition, the midsole of this shoe comes with the M Select Fresh organic odor control to prevent bacterial growth that may cause unpleasant odor inside the shoe. In the mid-foot area, there is a molded nylon arch shank to provide support for your foot arch. The arch support is good. It is not stiff; the arch shank is somewhat flexible so that you can turn and maneuver effortlessly. Finally, there is a groove that runs along the heel zone of the midsole to provide a springy feel and allow smooth heel-to-toe transitions. The outsole quality of Merrell Moab Edge is impressive. It provides excellent grip and traction on mixed terrain. It is still reliable even when climbing on a wet rocky hill. Your footing will feel solid without any significant tendency to slip. The superior grip comes from the large and tough multi-directional lugs. The lug height is about 5mm. These lugs have plenty of biting edges to give you great traction. The outsole itself is made from the TC5+ Vibram material, which is a high-quality material known for its grippy and durable nature. If you want a pair of lightweight hiking shoes that provide good protection and plenty of traction, Merrell Moab Edge is an excellent choice. The moisture-wicking upper is very comfortable. The midsole is cushy and supportive. The Vibram outsole and multi-directional lugs can provide great grip to give you solid footing on mixed terrain. 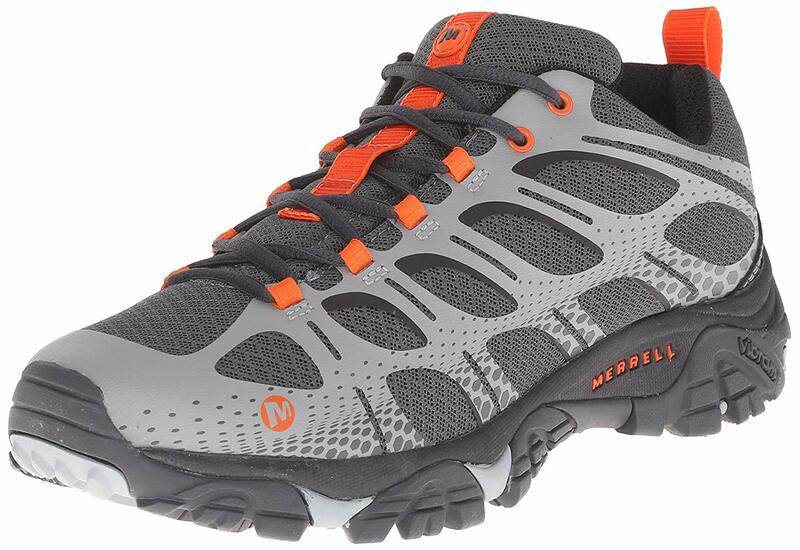 Get the best price for Merrell Moab Edge here!